Bangladesh is and has always been a violent state. 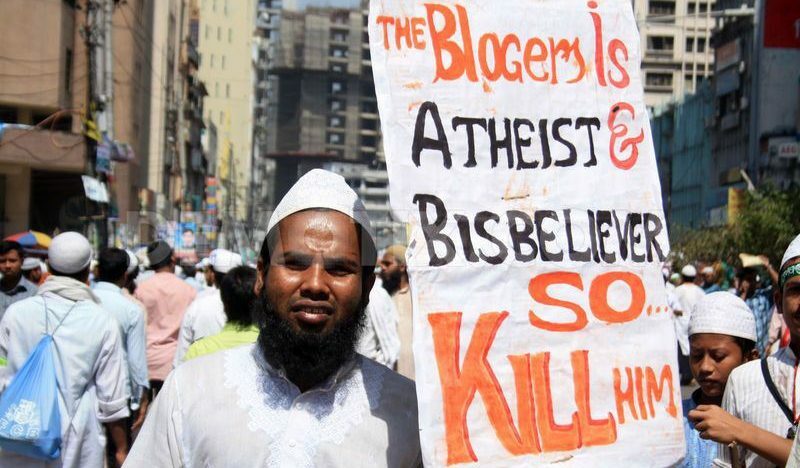 But suddenly the daylight beheadings in Bangladesh are making international news. The world did not bat an eyelid when in 1971 millions of Hindus were raped and murdered but now stray incidents of Islamic barbarity are making big headline news across the world. Bangladesh very effectively converted their Hindu minority into a micro-minority in five decades through active state policy without getting judged by the international human rights Mafia, so what explains the current interest of international news agencies in highlighting the plight of minorities there. Let’s try to analyze some of the recent events in BD. Given how they are reported, one can tell they are pretty desperate to make sure that the news sentiment has maximum visibility and portray that BD is going down. They tried to kill a whole assortment of people hoping to create local outage among the home communities of the victim. First they killed an Italian pastor, then a Japanese man, then a Buddhist priest, then an Australian, then Australia issued a travel ban and then they killed a Hindu priest. So, these are not random acts of senseless violence but seem to be planned(or highlighted) with great forethought. If one connects the dots one can realize that once the CIA gets to create an impression that ISIS is wreaking havoc in BD, then they can conveniently start an Arab Spring type colour revolution there. Already Zia has visited UK way too many times. It cannot be completely brushed aside that a coup might be in the pipeline. Every time a real attack happens, multiple terror groups usually try to take advantage of the chaos and claim responsibility. It’s only when someone wants everyone to think it was ISIS that such exclusivity is meted out. If it’s being reported in all major media outlets means someone is trying to promote the news to build a narrative. In all the previous so called ‘ISIS attacks’, the CIA allows the news to dissipate across time zones and then someone from their state department comes out and issues an official statement to bolster the claim. Last time they issued a travel advisory, before that they issued a ‘we’re concerned about what’s going on’ speech. BD has always been a violent place and only now it is being highlighted when it is convenient for some vested interests to highlight it. There’s a history to this pattern. When Modi first met Hasina at the UN meeting, he handed over a dossier to her which contained data pointing that a western government was trying to destabilize her government. The reason India chose to publicly declare that we had uncovered a plot to destabilize BD was because India wanted the west to know that it is watching. The report specifically mentions “a large western country is trying to destabilize Bangladesh“. When this revelation happened, the assassinations went silent for a few months, but now they have started again. Look at the above figure and see the enthusiasm with which the western media outlets have highlighted the story of death of a gay activist. The west seems to be engineering these events with the help from local Islamist parties. The fact that they had to execute a gay rights activist clearly shows that the target audience of this atrocity news is a western one, as there is almost no sensitivity in Asian societies about gay rights. It is the western audience that would get provoked by such a ‘transgression’ in this case. The west has been trying to generate pockets of outrage all over the world to create a build up which can be sealed by a final act of spectacular violence as the climax. The goal is to weave these individual stories together into a common thread of consensus among everyone that something wrong is going on in Bangladesh. Now they have killed a gay rights activist and planted sob stories all over the media for maximum reach. They are fishing for sympathy waves which would then by manipulated into outrage. Outrage which the US could then use as a casus belli to create the pretext for an American intervention. The fact that BD is Islamic is a disease inherited by them from history. It pre-dates Hasina by centuries and there is a limit to how reformist she could be in a Muslim majority nation even if she wants to. She can’t go against the grain beyond a point, even if she hates political Islam, just like Sonia couldn’t finish off all Hindus despite her unbridled hate for Hindus. This woman Hasina has to at least keep up the pretence of working on behalf of the people. She has delivered several top level wanted terrorists whenever India has made a request and more. It was Manmohan who messed things up by failing to prop her up when her government was under siege. Despite the menace of illegal immigrants coming from Bangladesh, having a destabilized nation in its armpit is not in Indian interest. If there is turmoil in BD, India will have to reallocate intel and military assets on the east which will take the pressure off the Pakistan border. Seems like someone is trying to give breathing space to Pakistani assets by carrying out these assassinations in BD. BD has always been a playground for Islamists but the synchronized media coverage by prominent western propaganda channels during these recent incidents only raises the question- why now?